Artist’s conception of proposed Chargers stadium in Mission Valley. A Los Angeles-area law firm is challenging an early step taken by the city to develop an environmental impact report for a proposed NFL stadium in Mission Valley. In a 34-page letter addressed to Senior Planner Martha Blake and dated Monday, lawyer Douglas Carstens urged the city to reissue a document called a “Notice of Preparation,” and for city officials to “develop a full understanding of the environmental consequences” before constructing a stadium. The lawyer said his firm, Chatten-Brown & Carstens LLP of Hermosa Beach, is involved in efforts to ensure state environmental laws are followed in projects, including sports facilities. 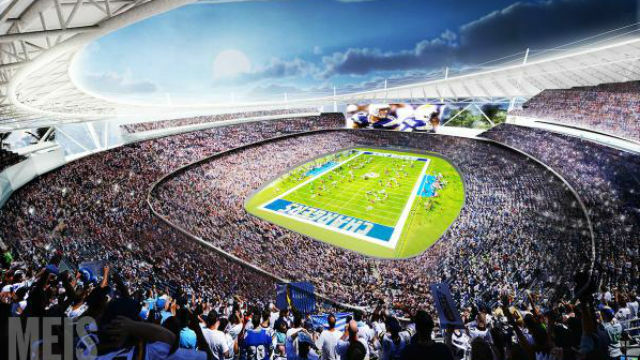 The firm has opposed exemptions to environmental requirements for previous stadium proposals in Industry and Los Angeles. “We view the Mission Valley proposal as the latest in this string of poor policy decisions seeking quick approval and avoidance of (the California Environmental Quality Act) rather than protection of the environment and affected communities to the greatest extent possible and necessary,” Carstens wrote. The city of San Diego is working on an expedited environmental report, known as an EIR, with the aim of getting a ballot measure before voters in January — which is when National Football League owners could make a decision on whether to move a team to Los Angeles. The Chargers have been asking for a new stadium for nearly 15 years, and have purchased property in Carson on which they could build a facility — possibly in concert with the Oakland Raiders. The faster EIR is part of the city’s effort to keep the Chargers in town. However, Mark Fabiani, who speaks for the team on stadium issues, said the environmental studies usually take 12-18 months. He said a report completed in a shorter time period would expose the city and team to litigation. Among the points raised by Carstens are that the Notice of Preparation fails to mention other development that could take place on the 166-acre Qualcomm Stadium site. While the mayor’s office recently pulled so-called “ancillary development” off the list of funding options, the lawyer said the demolition of Qualcomm Stadium and further development next to the new facility are foreseeable consequences of the project. However, city officials said now that other projects associated with the stadium are no longer being considered, it is not appropriate to study them as part of the EIR. Carstens also described the current stadium as a potentially historic resource, since it is one of the last remaining mid-century multi-purpose stadiums in the country.